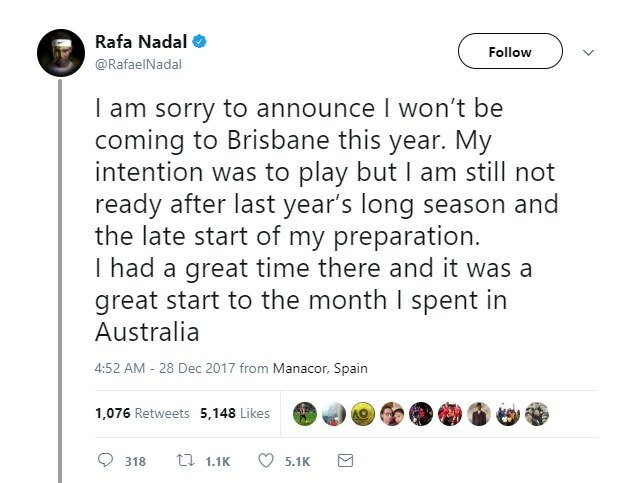 Rafa has announced on Twitter that he won't be playing in Brisbane. This begs the question if he will play in Australian Open 2018 as I am looking forward to his match against Federer!!! AO is around the corner!!! can somebody tell me in which tournament was he going to play in Brisbane if it's not Australian Open? (12-29-2017, 10:39 AM) Ù¹ÙˆÙ¾ÛŒÂ ÚˆØ±Ø§Ù…Û Wrote: can somebody tell me in which tournament was he going to play in Brisbane if it's not Australian Open? It's called FAST4 tennis tournament. In the same way Twenty20 cricket has revolutionised how cricket is played, FAST4 Tennis is a speedier form of the traditional game, intended to encourage audiences around the world to get back into tennis. FAST4 Tennis encourages lightning-fast play, with sets won when one player reaches four games, rather than the usual six or seven. Each set generally last around 15 minutes, even best of 5 sets matches generally not lasting any longer than 75 minutes! Players are not allowed to sit down between change of ends and play must resume within 60 seconds of the previous game finishing. Other rules include a sudden-death point if the score reaches deuce in a game or 4 points all in the tie-break and play on for all service lets! He is not in it for money of course. For him this is just a practice/warm up match before the real deal i.e. AO.